WhiteCloud Software Ltd. announced the announce the release of version 4.0 of EAComposer. An innovative and simple-to-use enterprise architecture tool used it to manage your IT landscape and technology portfolio. Delivered as a pure SaaS product: cloud hosted with a subscription based license model. In this release we have made significant enhancements to our Reporting & Analysis feature as well as minor improvements to Views & Models. Both are aimed at improving the ability to obtain insights from your architecture repository and portfolio. - All reports are now generating a visual model as the primary report output. The output of a report can be fully visually customized by exporting it as a model in Views & Models. Reports can also be exported as Excel documents. 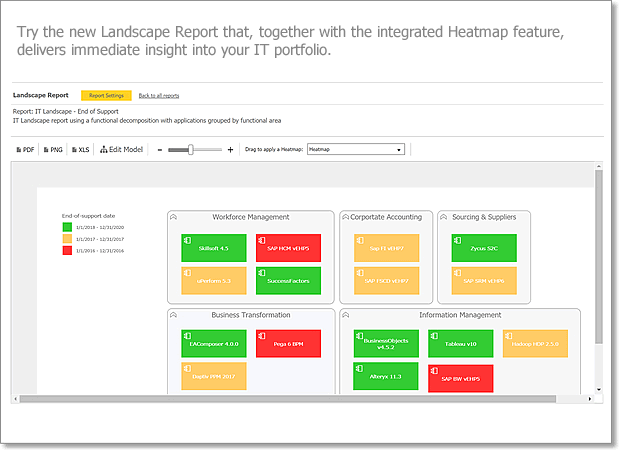 - We have expanded our iist of report types with a new Landscape Report option. You can see an example of this report included in this article. - The Heatmap feature is now also integrated with the reports which means that you can turn any report instantly into a Heatmap by simply dragging the heatmap onto the report. - When a Heatmap is dragged onto a report (or visual model) a legend for the Heatmap is automatically added to the report. - Several minor improvements have also been made to the Views & Models feauture to mirror the Reporting & Analysis enhancements.